Could I have more time to think about it? May I ask a friend for help? Can you ask that in a different way? Where could I look for that information? I know that some teachers want to replace “I don’t know,” but I think it’s a good thing to acknowledge that you don’t know, and it’s a good thing if a child is comfortable admitting if he or she really doesn’t know. From my perspective, “I don’t know” as the first step to learning! Want the prompts hanging on your walls? Download a poster with all the questions, or click here for a complete set of individual posters here. 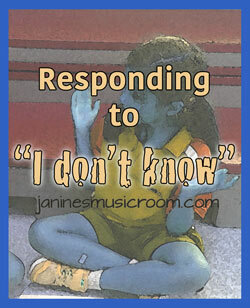 What do you do with “I don’t know” in your classroom? know the answer: “I’ll find out, sir/m’am”. That’s great! My dad was a Navy man, so I’ll admit I grew up familiar with some of those, ha ha. Thanks for reading and commenting! Copyright © 2019 Janine's Music Room. Powered by WordPress. Theme: Spacious by ThemeGrill.